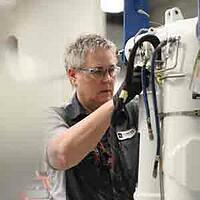 Many women work daily in technical roles at Duncan Aviation. These women are airframe mechanics; avionics and engine technicians; interior and paint specialists; design, electrical, computer, and structural engineers; and flight line reps. Even though aviation is traditionally a male-dominated field, there are plenty of career options available for women with rapid growth and excellent salary potential. Read on about four of these women–an airframe shift supervisor, landing gear master technician, avionics crew leader, and an engineering designer–who have decided to take the road less traveled and make their way and careers in aviation at Duncan Aviation. 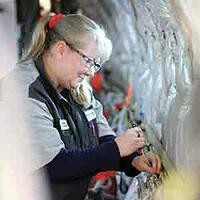 Sarah White has had two aviation careers. The first, courtesy of the United States Air Force, took her around the world working on hydraulics, flight controls, wheels, inflight refueling, and weapons systems aboard Boeing B-52s, F-4 Phantom II fighters, and KC-135 Stratotankers. After retirement from the military, her second aviation career began when she saw an advertisement for a hydraulics technician in Lincoln, Nebraska, while reading her newspaper and drinking her morning coffee. 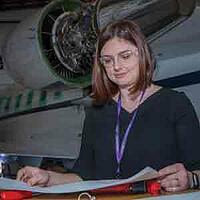 Twenty-three years later, Sarah is the senior member of the team and a master technician overhauling landing gear for business aircraft such as Challengers. Being the only woman on a team of men is not without its conflicts, but Sarah says for the most part it has been a positive experience. “Bias happens, but not as often as you would think.” Her advice to anyone doing what she does is to be confident in what you know and then put your head down and do the work. She says it’s customers who are sometimes caught short when she is called in for a consultation. “But as soon as I begin talking intelligently about the squawk and what I am going to do about it, we move past it quickly.” She says it is important to be able to take pressure and criticism on the job, no matter who you are. As the only engineer at Duncan Aviation’s Provo, Utah, location, Karen Itin is kept busy creating schematic drawings for interior structures supporting aircraft cabinets, seats, and antennas. It is this behind-the-scenes aspect of her work that she likes most about her job.